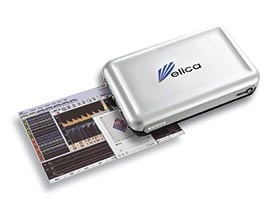 TCD Monitoring - Delica Transcranial Ultrasound Doppler - Products - SMT medical GmbH & Co. The Delica EMS-9UA can lay claim to several advancements in TCD monitoring. 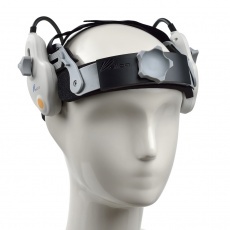 The most important consists in robotic probes, integrated into a bilateral head frame, able to search, optimize, and keep track of bilateral TCD signals in the MCA. In ‘Tracking Mode’, probes are automatically controlled, adjusted and fine tuned, ensuring an optimal signal even if the patient is moving. Delica EMS-9UA, the first robotic TCD system on the market, enables the operator to comfortably achieve insonations for up to several hours, without the need of manual probe adjustments, despite patient movements. Especially during surgical procedures or physiologic testing, this unique system offers substantial advantages in effort, time, and quality when compared to conventional, manual probe holders. In combination with the versatile EDS, based on neural networks, embolic signature detection becomes an operator independent routine. Up to eight high resolution spectra can be displayed, with sample volume gates changed individually or simultaneously. In M-Mode, colour coded blood flow velocities in up to 128 depths are displayed and controlled. The 1.6 MHz monitoring probes impress by better penetration, yielding better signal quality. In vasospasm, higher PRFs allow insonation velocities of up to 750 cm/s. A conventional, practice proven head frame with manual probes is also available. 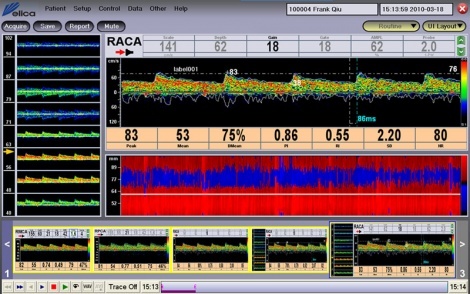 The Delica TCD software offers an extremely flexible user interface for diagnostic protocols , monitoring sessions, and physiological tests. The screen can be adapted to user required purposes and saved into “Procedures”. Once configured, a procedure can be recalled any time later, facilitating and accelerating testing routines. For diagnostic purposes, configurable protocols with vessel tags and automatic depth adjustments can be used. In monitoring mode, spectra, high resolution M-Mode, and/or trends can be displayed, stored, and documented. Configurable event markers and the automatic recording of VMR tests are just some examples of the numerous features of the Delica TCD program. All Doppler parameters can be set independently or simultaneously by use of the convenient remote control and/or by an optional touch screen. Monitoring sessions can be recorded for hours and stored along with trends, spectra, and envelopes. For replay, a convenient recorder interface is integrated. In addition to play back of original spectra, the Delica TCD software also allows replay of data in M-Mode. 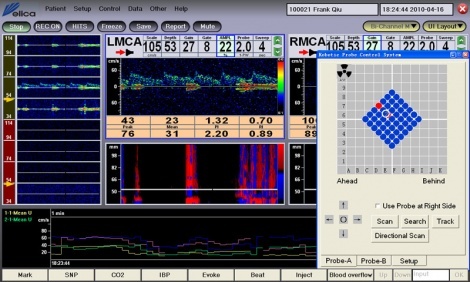 Doppler data can be documented or exported in a variety of formats: RAW, BMP, XML, PDF, DOC, WAV, AVI. An optional DICOM interface is available. Stored parameters may be analyzed in an integrated statistical package, results displayed as regression graphs, column or pie charts. Expect fast and competent service from a team that has over 30 years of special Doppler and TCD expertise. Our long-term customer relations are built on trust and fairness. The Delica Doppler systems complements this philosophy of effectiveness and reliability.